Unpleasant sensation or pain in the small of the back is a symptom of many conditions that affect the spine, spinal ligaments, back muscles and the nerves. The health remains reasonable, and pain may only be symptoms in the initial stages. A backache can turn out to be a serious condition specifically for a kidney disease or a urinary problem. The urine must always get checked for protein, and a record of pulse and temperature is recommended strongly. A simple backache: It can appear for no reason at all or due to jerk in the back or after a heavy work. The pain varies between very slight to huge disabling pain. Spasm of the back muscles can make it severe on a movement involving the trunk. With rest and proper treatment, the pain settles down within several days. The patient should not do heavy work but can resume the work. Some patients have a severe backache right from the start and may have shooting pain in the leg, and the nerve gets affected. A sensation of numbness and tingling or burning pain traveling down the leg. The easiest procedure is to let the patient lie so that the spine remains straight. Use a board or surface that is hard and is a flat surface with no padding till he is all right. He should lie in a comfortable position. Painkiller available over the counter can get used with the permission of the Doctor. The patient should be washed in the bed but allowed to use the toilet and not a bed pan. Local warming through hot water bottle is desirable. 1. Get bed rest. The orthopedic surgeons recommend it. It is the only thing one would do on its own. Keep the activities to the minimum for one or two days. 2. Follow the exercises explained below. It may seem strange, but the back specialist Roger Minkow M.D, founder of Backworks in Petaluma, California recommends this. Get a consent from your doctor if you can do the exercises at your stage of pain and health. Press up: Lie flat on the stomach and arch and put your hands and do a push up once in the morning and another in the evening on the first day. Make a crunch: Lie flat on your back bend your knees and bring them to the chest. Encircle the knees with your arms and hands. Bring your head and shoulder off the floor as much as possible for a second and repeat. Dr. Minkow directs you to Swim on the dry land: Raise your opposite hand and leg about 30 degrees in the air alternately for about 2/3 seconds while lying on your back. Get on a Stationary exercise cycle, adjust your seat height so that the trunk remains straight and hands stand firm and comfortable at the handle of the cycle. Start cycling with ease without any strain anywhere. While undergoing the physical exercising, ensure that at no stage you strain or hurt yourself in any way. Do not get into any adverse hurtful condition. Stop the exercise if you have any pain, discomfort anywhere. It is best to take a rest. If you feel fine, continue the practice after a day or two. 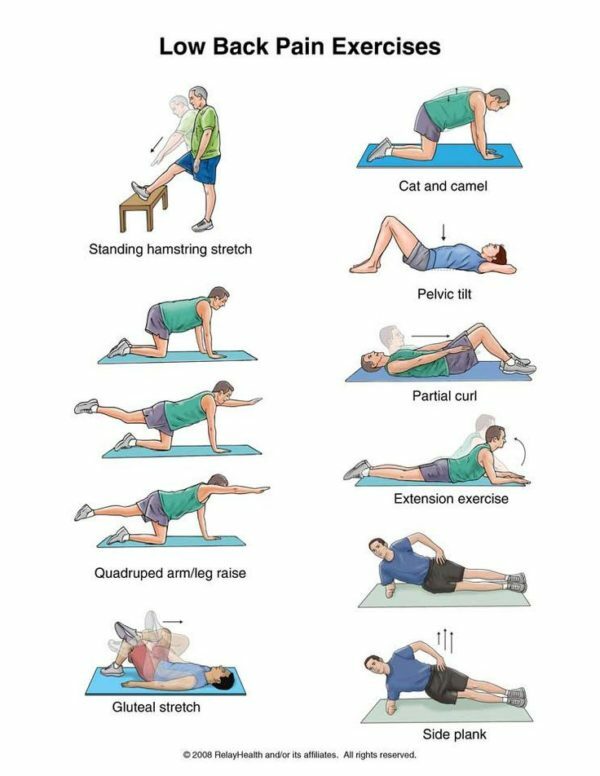 You may add more exercises gradually to keep the back pain under control as illustrated in the figures above. If, you have a sedentary job and have to sit for hours, adopt some corrective measures to control a backache that may develop for not taking care of your back(spine). Usually, people like to sit in the front portion of the chair. That way it is easier to work on the computer. Slowly over the time, this habit costs dearly in the form of getting lower back pain. The body shape changes and one tend to bend forward, and the backbone turns, and the ache is sure to creep in. To counteract this make a foam roller or put a cushion at the back. Sometimes make a crutch of the both hands by interlocking the finger and rest your head and relax in this posture. Sit straight up in the chair and do not sit in the front portion of the seat. At times lay your head on the chair and get relief from the tiredness. The pain stretches to: from the lower back over the spine, tissues, the bone structure in the areas around. The pain may spread from the mid or the upper back, hernia in the crotch or pain in the testicles and ovaries. On hurting the back, the pain signals can vary in different forms of the weakness in the legs or the feet, or burning sensation or a mild or sharp continuous pain. Don’t rest too long: It is the best policy to get out of bad as soon as possible after the bach ache is found out. One to three days of rest is fine depending on the severity of the pain. However, earlier the better. Pain is the test to take a decision. It takes double the time of bed rest period to rehabilitate. It won’t necessarily be one event that generates your pain. You may have been doing many things poorly — like standing, sitting, or lifting — for a prolonged time. Then swiftly, one simple action, like reaching for any object in the shower or bending from your waist, starts to the feeling of pain. The Chronic back pain is lasting more than fourteen days. Back pain that spreads down towards your leg to your kneecap or foot. Back pain that appears suddenly with no particular reason.